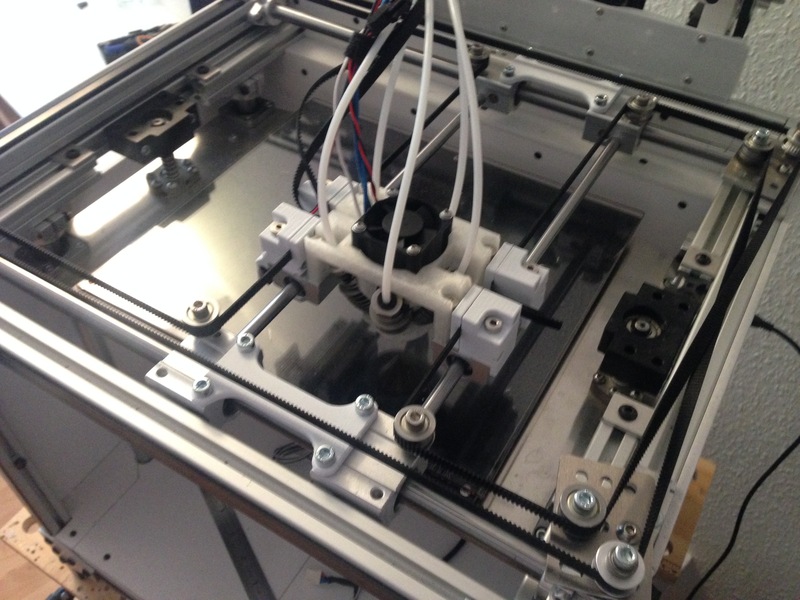 Posts about building and using 3D printers. Putting the 5way Diamond together. Aside from this one having 5 heatsinks and the previous version had 3 heatsinks, the method of assembly is the same. I’m using some high temperature paste to coat on the Heater Cartridge, and fill up the hole for the Thermistor (I’m using a Thermocoupler). The 5way Diamond will ship with a 60w heater cartrdige, but since they havn’t landed in Denmark yet, I’m using a 12v 30w E3D cartridge which will magically turn into a 60w 120w heater as I’m running my BeTrue3D Printer as a 24v system. I have contacted E3D to hear about quality of their cartridges – wheter it can sustain the increased voltage/current through it. I can limit the voltage in firmware and hit the recommended 60w, but still need to hear from E3D wheter it’s ok or not. I’m coating the heater cartridge in the paste, and insert it into the middle hole. At first I had no paste coming up, so I applied a good deal more and inserted it once again, while rotating it. This time I had a deal of excess paste coming up, which I cleaned away using a cotton tip, and then inserted into the hole for thermistor/thermocoupler. Screwing on the individual heatsinks, while making sure the Thermocoupler and Heater Cartridge stays in place. I’m first going to put a ø2,5mm drill through the holes I made to mount my 40mm fan. I then tapped the holes with an m5 tap to make it easier to mount the fan later on. Afterwards I start by inserting a plastic zip-tie to hold the cables in place, once I clip on the entire assembly onto the Carriage. Carefully putting the wire through the Carriage, without uprooting the Heater and Thermocoupler, and clip on the assembly. Making sure all 5 heatsinks has clipped on. Securing the cables in place. The insulation is taking too much space, so had to remove some of it. Once I’ve fixed the cables and made sure the heatsinks are all in place, I use a zip-tie to fasten each heatsink to the Carriage. Normally you might use a 50mm fan, but I had this nice 40mm 20mm thick fan lying around, and made my carriage to fit. 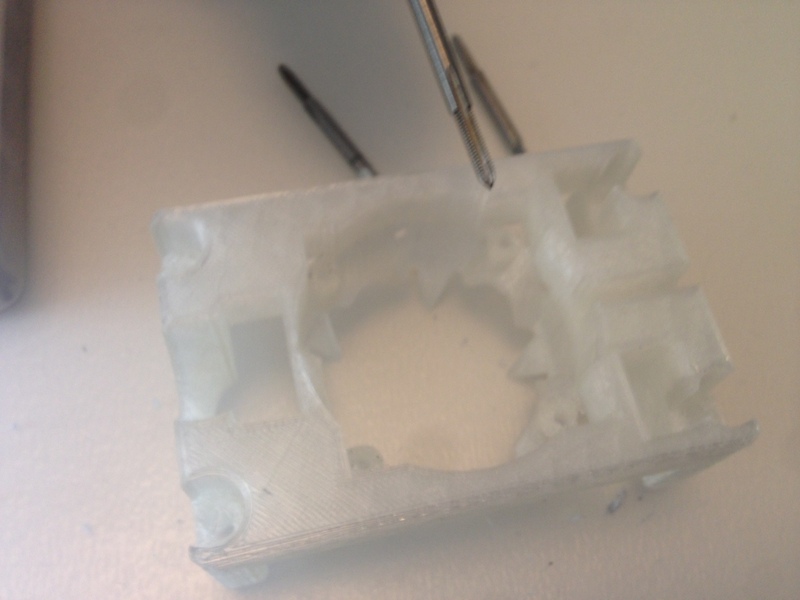 I’m printing some struds to fasten the two X sliders on both sides as I write this, which are needed to make it work. Here’s some images of the struds and some tidying of the wires and bowden tubes. I think I’m going to combine the Carriage with belt fastener. Not entirely sure yet. My overall plan has always been to make a Carriage system where I can drop in change between the 5way Diamond and and E3D hotend and such, but not entirely decided yet, how it should work. Regardless though, I need to make some mounting points for fans on either side of the nozzle. 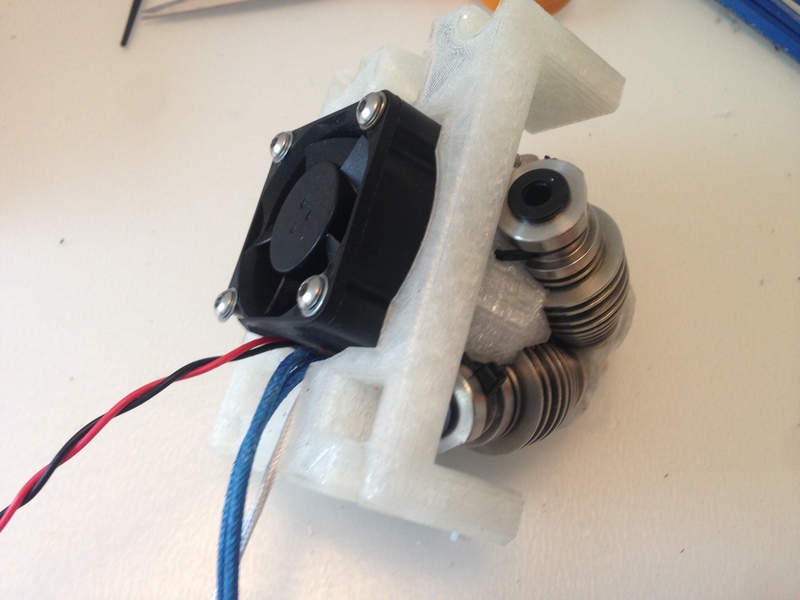 I really like your post and am happy to see there is work being done on a 5 diamond hotend. Having a five color mixing hotend means there there is almost limitless options for colors. I was just wondering if you have any idea as to when this will be for sale.